We love gold leaf! 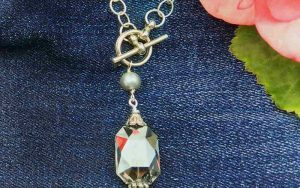 You can turn a thrift store throw away into an eye catching gem with just a few steps. 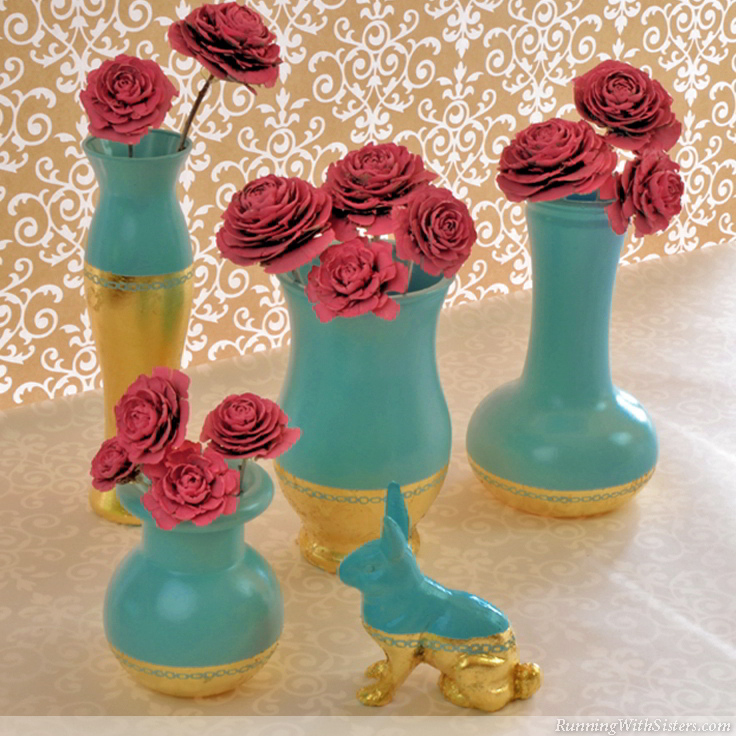 To show you how easy it is, we went to our local Goodwill and found vases with great shapes and drab looks. 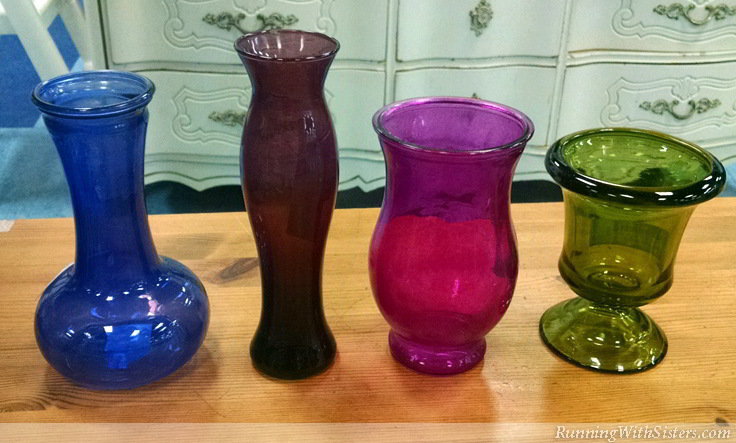 We chose all glass vases so the finishes would turn out the same, but the colors didn’t matter to us at all. 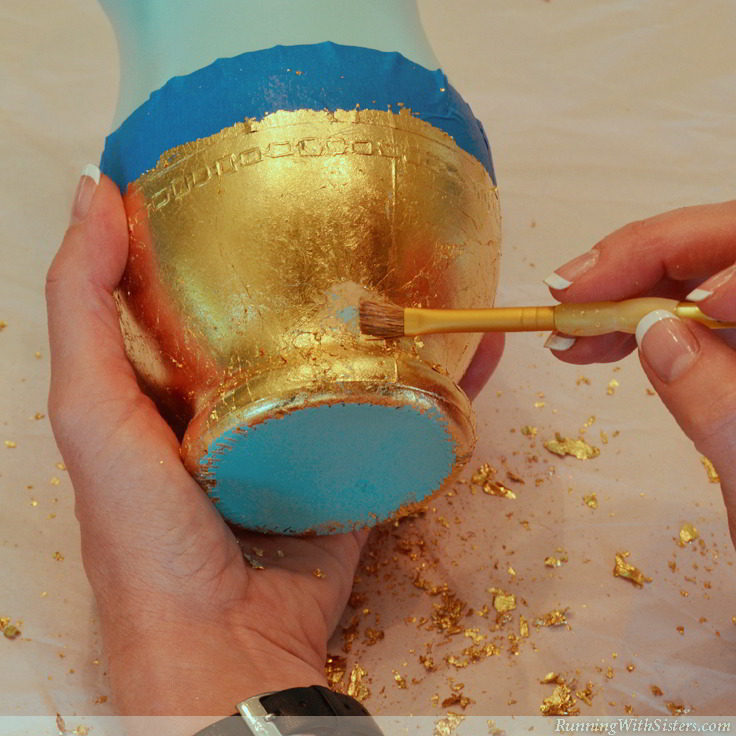 We’ll show you how we spray painted the vases Tiffany Blue, then we’ll show you step by step how we gold leafed the bottoms. We’ve even included a video we made showing how we gold leafed a picture frame, in case you want to see it in action. 1. 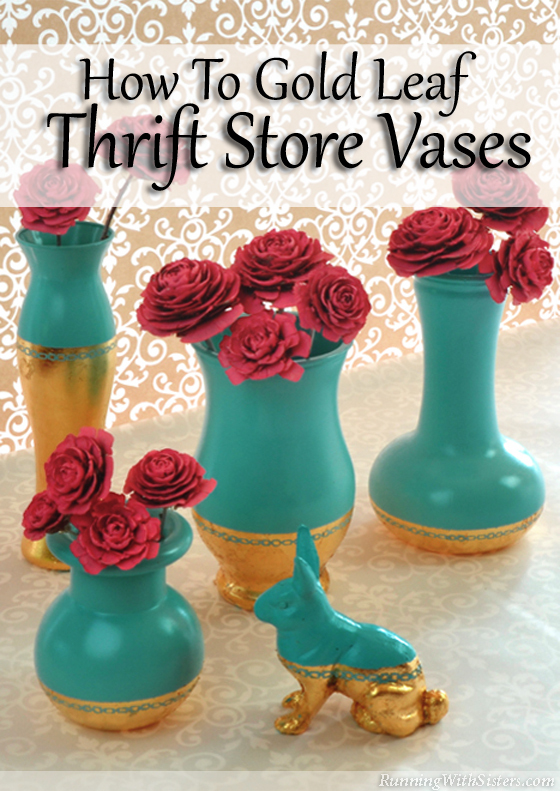 Start by gathering the vases you want to upcycle. We found dozens of glass vases at the thrift store and narrowed down our choices by looking at their silhouettes. We paid about $2 apiece for ours. What a deal! 2. 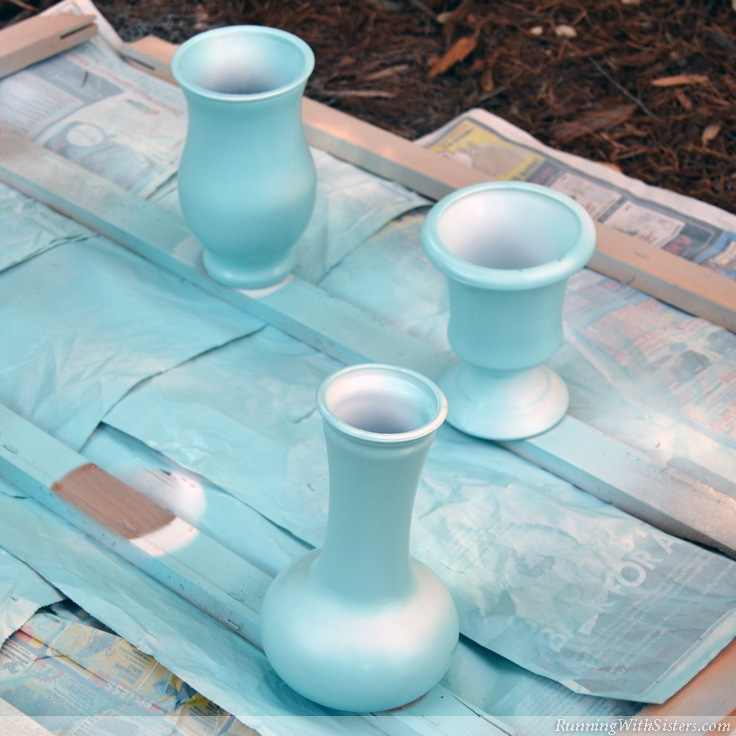 Wash and dry the vases, then prime them with white spray paint primer. 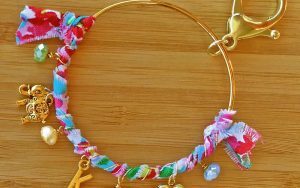 Use a sweeping motion starting off the item, sweeping over it and finishing off the item. To prevent drips and sags, do several light coats rather than one heavy coat. Let the coats dry in between. To clear the nozzle, turn the can upside down and spray. This helps if the paint starts spitting. 4. 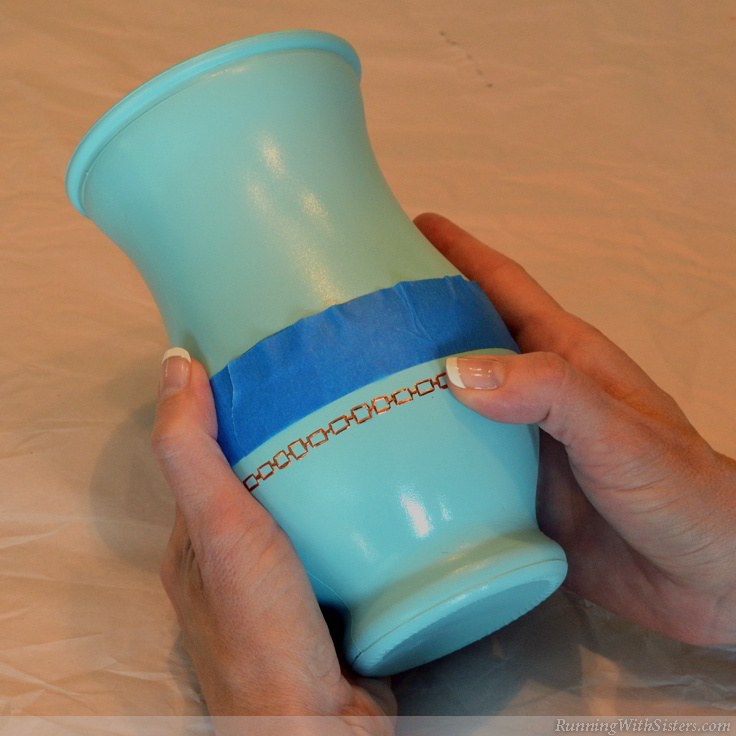 Mask the vases with masking tape. You can just use plain masking tape for a simple division between the paint and the gold leaf. We wanted to add a little texture and interest, so we also used a decorative sticker called a peel-off. Peel-offs are vinyl, die-cut stickers so they are strong enough to be painted over, gold-leafed, and rubbed. And they leave a crisp line. 5. 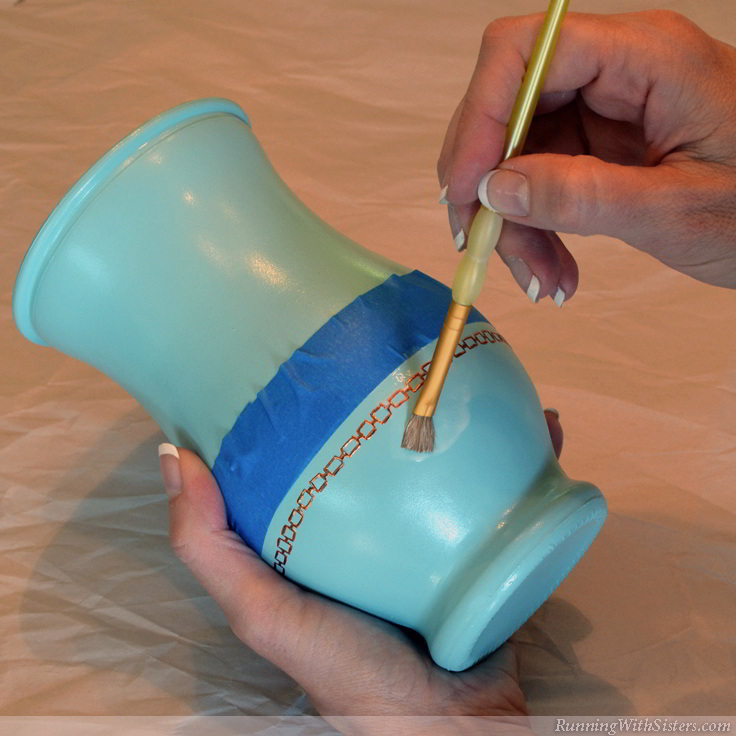 Paint the Gold Leaf Adhesive Sizing (this is like runny glue) onto the vase with a paintbrush. Apply a thin coat and try not to let the glue pool. Let the glue dry for 15 minutes. It will get very sticky! 6. Apply one gold leaf sheet onto the sticky glue, pressing it down with your fingers. Then brush over the gold leaf with a dry paintbrush. Repeat with more sheets to cover all the glue. The gold leaf sheets are very thin. When you pick up a sheet and lay it on the tacky area of the vase, it may rip. Don’t worry! The pieces don’t need to go down in one smooth application. 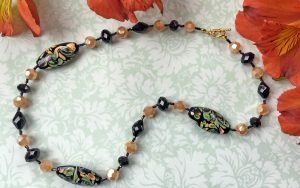 Gold leaf magically heals itself and leaves no seams between pieces. 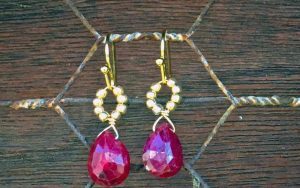 Keep applying the pieces of gold leaf, recycling pieces that brush off. Rub the gold leaf into the vase with your finger, then brush off any excess gold leaf that hasn’t found any glue to stick to. Here’s our video showing how to gold leaf a picture frame. We thought it might help to see how the gold leaf works. Even though this video shows a picture frame makeover, the gold leaf will act the same on the vases. 7. 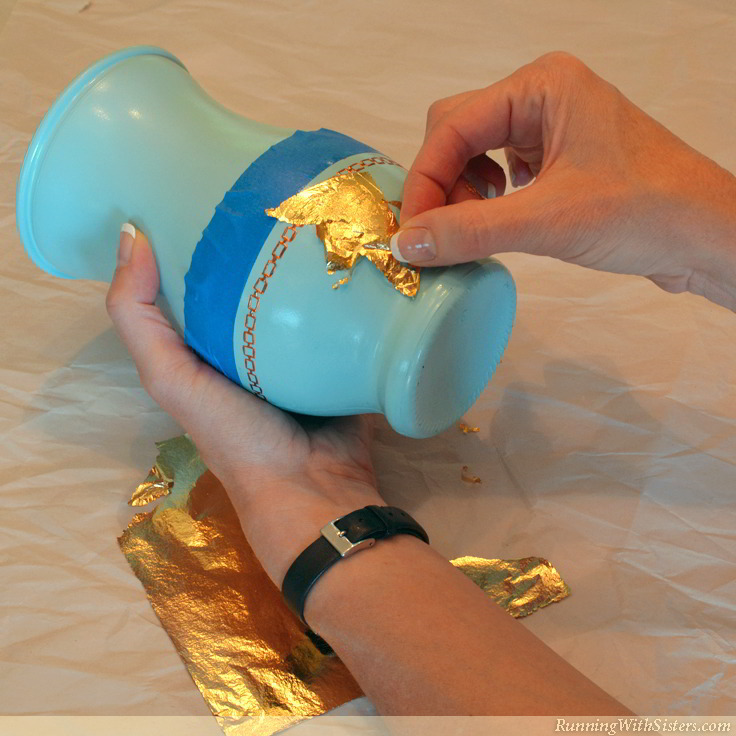 If you see parts of the vase where no gold leaf attached, and they are no longer sticky, paint a little adhesive sizing on the spot. Let dry for 15 minutes, then add more gold leaf. Smooth the surface with your fingers and the dry paintbrush to remove any loose pieces. You can save all these loose pieces and use them on your next vase! 9. Remove the peel-off stickers and the masking tape. Ta-da! We hope you find gold leafing as magical as we do. If you do, let us know in the comments! 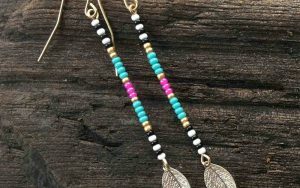 We’d love to hear what you gold leafed and how it turned out. Whatever you end up gold leafing, have fun!